YouTube turned eleven years old this February. As a social platform, it has changed the way we consume information and entertainment content. But like most technologies the Internet has brought us, we still have a lot to learn about the potential side-effects of these platforms. In the case of YouTube, copyright infringement is one of those side-effects. In a world where being a YouTuber qualifies as professional work, the concept of intellectual property gets new meanings. Vlogs, tutorials, news stories and reaction videos are some of YouTube's most popular video formats. Most of these predate the existence of YouTube. 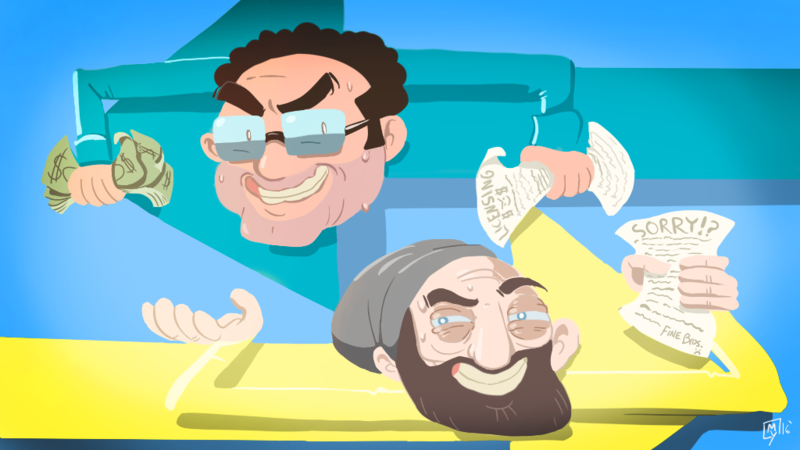 The Fine Brothers' attempt to trademark a popular format is not simply a matter of greed. It is a sign of how far content creators on YouTube can go in order to protect their businesses and revenue streams. The Fine Brothers are perhaps the most popular exponents of the reaction video genre on YouTube. With over 13 million subscribers to their main channel and a view-count approaching four billion, Benny and Rafi Fine have built a substantial community of followers. Inspired by their success, many of these followers may have tried to create their own content. It is natural that some of this content would be reaction videos, resembling the Fines' reaction format to varying degrees. The Fine Brothers saw this as a violation of their intellectual property. Now, the YouTube platform allows some creators to directly take down videos that they deem to be copyright violations. The Fine Brothers have received backlash in the past for doing so. And in a recent video that they've since deleted, the Fine Brothers announced their new licensing platform called ReactWorld. ReactWorld would have allowed channels to create "licensed" reaction videos. As preposterous as that sounds, the true beauty of the plan was that YouTube's current regulations would have allowed that. Fortunately, the YouTube community went up in arms against the Fines as the news of ReactWorld spread. The Fine Brothers started losing subscribers and published a video explaining how they had been misinterpreted. When that didn't stop the subscriber count from falling, the Fine Brothers eventually backed down. In an apology letter posted to Medium, they rescinded all React trademarks and applications, discontinued ReactWorld and released past copyright claims as well. As far as apologies go, there wasn't much substance in the letter. The Fine Brothers still maintain that they were misunderstood and that although their "intentions are pure, there's no way to prove them." Convenient. The controversy has raised an important issue though. With new content platforms on the rise, intellectual property law needs to be revisited. What the Fine Brothers tried wasn't outlandish. And had there not been the community backlash there was, the Fine Brothers would not have rescinded their trademark claims. If granted, these claims would have affected any channel posting reaction videos or any video that contained similar elements. The Fine Brothers used Burger King and "Britain/America's Got Talent" as analogies. If they'd been successful, a dangerous precedent would have been set for any corporation to take advantage of. If a highly popular YouTube channel can resort to such tactics, would it seem as far-fetched when a talk show host files a copyright claim on the "talk show" format? In the midst of all this, many YouTube channels have been taken down or had their monetization suspended. More popular channels with significant communities of their own can survive until the YouTube framework sorts itself out. The budding teenager drawing inspiration from her favorite YouTuber, not quite. And if YouTube knows who its audience is, sorting out its broken copyright system should be a priority.